I’m getting one point (Hellman’s light). Still a great snack/breakfast but wondering about the difference in my calculations? Have fun in Florida! This review actually refers to her instant pot deviled eggs, which is a similar recipe except that it also uses some milk and pickle juice and is so good. Made as is and these are even BETTER than the less healthy traditional versions. Thanks!! I am confused! I entered everything using the recipe builder. It came up 1 pt for 2 halves for me too. Why is that? I am making these tomorrow regardless….they look fab! EVERYTHING I make from Skinnytaste IS fab!! Been using it for a loooong time and going to buy the cookbooks tomorrow!! ? I really like using spicy brown mustard. Question concerning the points. How is this 0 freestyle points when there is mayo in it? If you eat 5, it won’t be 0. Use recipe builder. How many Freestyle Points please? I’ve put it into the recipe builder and it comes out as 1 point for 2 halves. I’m not sure why the calculation on this one didn’t switch over correctly for the smart points. Wouldn’t the mayo in the recipe make these 1pt per serving? I took another reader's advice and did half cottage cheese and half mayo. These were absolutely fantastic!!! Love the simplicity of this recipe. I would always add onion and relish to my recipe but I like it much better without that. 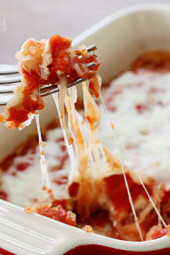 This is easy and delish!!! Does the calories listed count for only one or the serving listed? I replaced the mayo with plain greek yogurt and it tasted great! 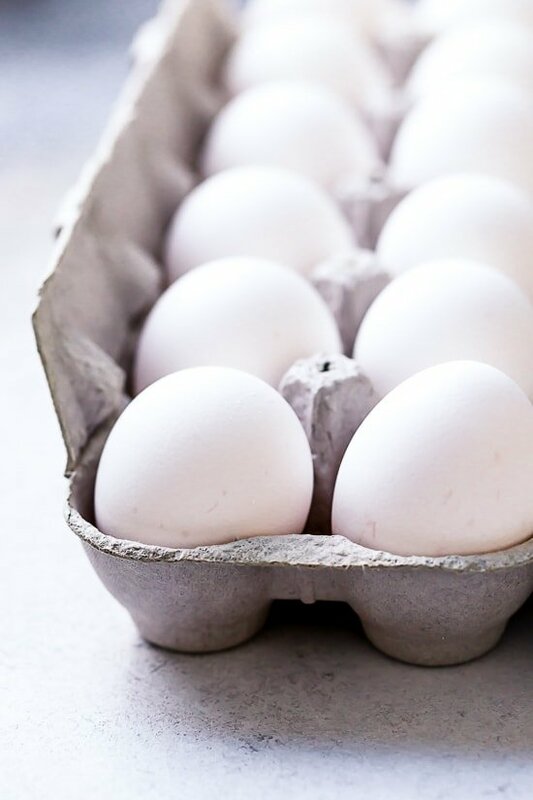 Try making the filling this way – put yolks and other ingredients into a ziploc. Mush them up, then cut off a small corner and pipe them into the whites. Easy clean up, hmm? My mom makes these the EXACT same way. They're so good! I tried making these in preparation for Easter, instead of using paprika I add a dash of chipotle powder to each one. YUM! you could also add a bit of wasabi instead of the dijon mustard. Gives you the a little horseradish heat, and just a smidge of unusual flavor. I can make deviled eggs for ONE pt per two halves and it involves replacing about half the yolk mixture with pureed cauliflower. 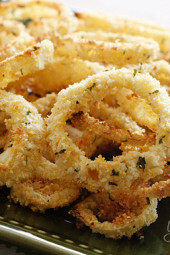 They are delicious and no one knows its in there….basically I use the same binder as you do with the lowfat mayo, but I do add just a bit of horseradish also. YUMMY! I've never tried it with cottage cheese, thanks for the tip!! I used to use a sandwich bag all the time… just went out and got a pastry bag!! 🙂 I make DE's alot… sometimes I put bacon bits (REAL BACON) in them YUM-O! Another point saver is try using FF cottage cheese instead of mayo. I need more of that in my life. You know what else I need more of in my life? Deviled eggs. Made a batch the other day… I ate them in one sitting. I couldn’t eat that many eggs cooked any other way, I’m sure of it, but with deviled eggs, I think I could eat a million of those devils!thank you for shearing your post. @Sherryl, great idea! @Duo Dishes, I use a sandwich bag to pipe mine, just fill the bag and cut the corner of the bag with a scissor. easy cleanup! I wish you a great trip, enjoy and relax my friend! Great snack these Deviled Eggs! Who doesn’t like a deviled egg? Ours are always taste but ugly. Maybe we should try piping the filling in. I love your site (although not a deviled egg fan!) One more way to save pts though — after my fatherinlaw’s heart surgery, I made deviled eggs with egg beaters and just threw the yolks out. just let the egg beaters set up in a hot pan, and voila! Instant, healthy yolk! Keep up the great site! These eggs looks delicious!!! Thanks Gina. My kids love my deviled eggs, but mine are not low in points, lol! These look delicious Gina. I hope you and your family had a wonderful Easter. Yummy yummy, love deviled eggs!!! I love deviled eggs…these looks scrumptious! Hope you’ll have a safe vacation and Happy Easter! P.S. 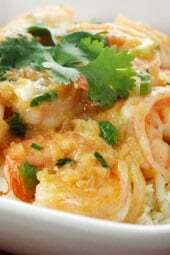 Thank you for taking the time and posting all these awesome recipes. 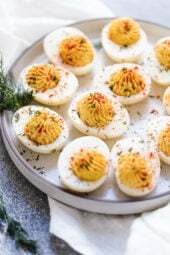 I love deviled eggs and these look delicious, Gina! Have fun in Florida!